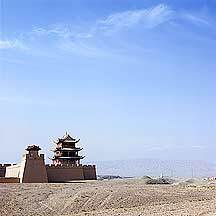 嘉峪关市Jiayuguan City is a perfecture level city name after the famous pass. Originally a small town set up to service the troops sent to station here. Today it is the largest producer of iron and steel in the northwest. 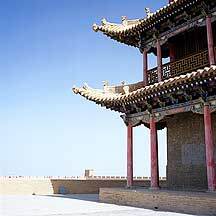 嘉峪关Jiayuguan Pass was a 明Ming Dynasty (1368-1644) creation. But the pass itself had been of strategic importance since the 汉朝Han Dynasty (206 BCE - 220 AD). And troops had guarded this area from then on. The Ming calvary arrived here on the 4th year of the establishment of its empire. Later in 1495, the citadel was built. Several years later, the Eastern and Western Towers were constructed. To complete its defence system a 50km long wall was piled up by 1536, which blocked the flat valley between the 黑山Heishan (Black Mountain) and the 文殊山Wenshushan Mountain. Part of the wall also extended up the Heishan. 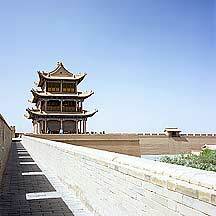 This narrow pass is situated about three-quarters west of the fabled 900km long, goose-neck shaped 河西走廊Hexi Corridor (so named because it is located west of the 黄河Huang He (Yellow River) ), also called 甘肃走廊Gansu Corridor, that is entirely within 甘肃省Gansu Province today. North and south are flanked with serveral mountain ranges. On the south is the large 祁连山Qilian Mountains (of which Wenshushan Mountain is a member); on the north is the edges of the 大漠Gobi Desert dotted with several smaller mountain ranges which includes the 马鬃山Mazongshan Mountain (of which Heishan is a member). Since its creation, the outpost was the most westernmost mark of the empire. 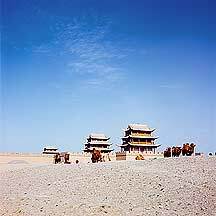 As that, it also regulated the traffic in and out of this ancient trading route that was so vital during the 丝绸之路Silk Road (or more accurately, the Silk Route) Era, and became a dividing line that separated what was Chinese Civilization and what was not. The Pass is on the west side of the oasis city, about 6km away. It was built on the rocky mound in the highland, about 1,625 meters above sea level. The entire complex consists of an outer town and an inner town: the outer town has a 1,100 meter wall around its somewhat rounded rectangular-shaped border; the inner town is a square walled military compound made up of adminstration buildings, gate towers, corner towers, arrow towers, 瓮城barbicans, as well as a temple. Outside the West Gate is the empty valley and the endless desert. See a satellite image of the Pass. --- June 04, 2010 --- A video shot of a typical street scene in 绍兴Shaoxing in 浙江Zhejiang province. --- May 28, 2010 --- A video clip of night scenes in the beautiful city of 苏州Suzhou. 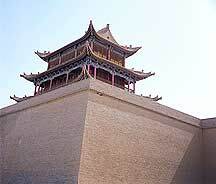 The tapering walls are about 11 meters high. The grand west gate and tower. 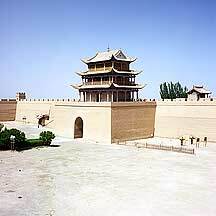 Chinese fortress design was the most advance of its time. It's a lonely pass. But the city had expanded to almost its mighty walls. Outside the fort are mounds of bare rocks and rough sand. Inside the fortress. It is rectangular or trapezoid in shape with inner and outer walls. The area between the inner and outer walls as well as all empty spaces act as trap spaces where enemy troops would be shot with arrows from atop the wide walls. The lane atop the walls are about a meter wide. View from the north outside from the west gate. View from outside the west gate. 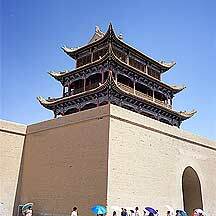 During the Ming Dynasty, this is the borderline between what is Chinese civilization and what is not. A panoramic view of the Pass. One of the three three-storied towers. A closer look at the tower. This should be the west tower. The middle tower. The tower is very likey totally rebuilt not very long ago. The three-stories towers are about 17 meters high. The entrance to this tower was not open to the public. The great wall that stretch out endlessly southward from the pass. 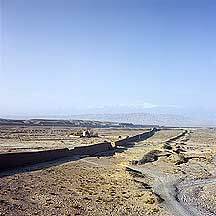 It will eventually reached the wall of the Qilian mountain ranges that make up part of the Qinghai plateau. The wall that extends south of the pass. On both sides are just bare rocks and dotted with a type of desert plant. Full view from south side of the Pass on a raised rocky mound. The sourrounding area is a desert (the edges of the Gobi Desert), nothing but camel droppings on the dry undulating earth. 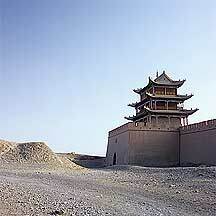 Outside the wall and facing west of the main gate, all the eye can see is sublime nothingness. 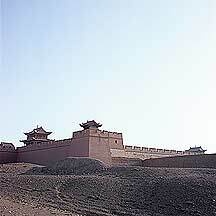 The south wall of the fort that extends toward the snow-capped Qilian mountains in the distant. 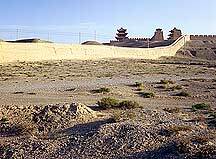 The extended great wall is mostly of packed yellow earth reinforced with dry reeds, so the unguarded barrier is quite easy for the locals to just dig an entrance. My translations of some Chinese poems. Pictures I took while on a bus traveling through the sandy deserts of 甘肃Gansu on my way to 嘉峪关Jiayuguan. The compounds and manors of the extreme wealthy in 山西Shanxi's small towns and villages. See the old town of 平遥Pingyao with well-preserved Ming and Qing city wall and street layout.